Today I’m bringing the eighth and final installment in my study into Floriography — the cryptological communication through flower use or arrangement. Tulip ~ A classic flower of love. The most famous illustration of tulips’ popularity was the brief period of so-called tulip mania in Holland during the Dutch Golden Age (ca. 1634-1637). 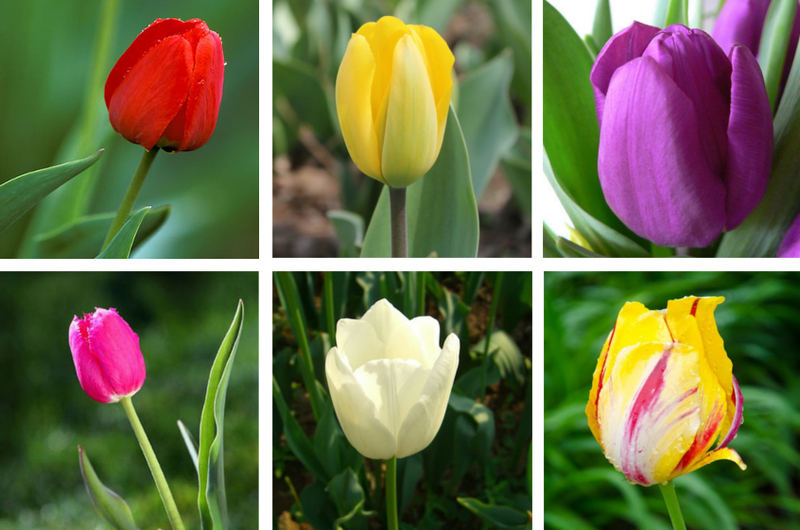 Tulips had been recently introduced and quickly became important symbols of status, to the point that tulip bulbs were used as currency. As with roses different colors bring their own meanings. Red Tulip – Passion and perfect love, a declaration of love. Yellow Tulip – Hopeless love, unrequited or spurned love. Purple Tulip – Royalty, but also abundance and prosperity. Pink Tulip – Less intense affection and love. White Tulip – Asking forgiveness, an apology. Tansy ~ Health, longevity. The fragrance of tansy is pungent yet appealing, and the bright yellow color adds to the beauty of any bouquet. Tansy has been used as a medicinal herb for centuries, the uses ranging from calming nerves to expelling parasites. Symbolically the tansy plant is said to be an emblem for protection against adversity, or to represent health and endurance. Violet/Viola ~ Modesty, faithfulness, modesty, virtue, affection. Violets, historically, have a dual nature in their symbolism. They are emblems of peace, spirituality, and imagination. At the same time they are common flowers for mourning and sadness, and to show respect for the dead. Romans decorated their tombs with violets as a symbol of mourning and affection for the dead. In the Middle Ages they were the symbol of faithfulness in love, and were strewn on the floor as an air freshener due to their sweet perfume. Veronica ~ Fidelity. The medicinal uses of the Veronica flower – which range from anti-stringent to expectorant and diaphoretic – were once linked with religion, as the Christian church felt that this blossom was mankind’s, “one true medicine,” just as Jesus Christ is thought to be mankind’s, “one true savior.” Other than the deeply religious, and sometimes unearthly tales that have been told of this plant, they are most often considered symbols of marital fidelity. Wisteria ~ Welcome, good luck, devotion. In China, Wisteria is commonly featured in art and plays involving marriage. Since the vines and trees bloom in spring and early summer, Wisteria is a potent symbol of new life. Zinnia ~ Thoughts of an absent friend, constancy, lasting affection, steadfastness. 18th century German botanist Johann Gottfried Zinn, a professor at the Gottingen University, became director of the botanic garden in 1753 and published the first scientific illustrations of the flower which, in time, was named after him. The zinnia is a tough plant that endures through many trials and tribulations (unforgiving heat, drought, bugs), and continues from youth to old-plant-age to put forth beautiful flowers in multiple shades of red, orange, apricot, yellow, white, lilac, and green. For this reason it is easy to understand how the symbolism has evolved to mean endurance and constancy. Yarrow ~ Health, healing, cure for a heartache. The yarrow flower’s scientific name – achillea millefolium – derives from a Greek myth of Achilles. Legend says that Achilles brought the plant into existence by dropping the rusted metal scraping of his spear to the earth below him, the flowers then springing forth. 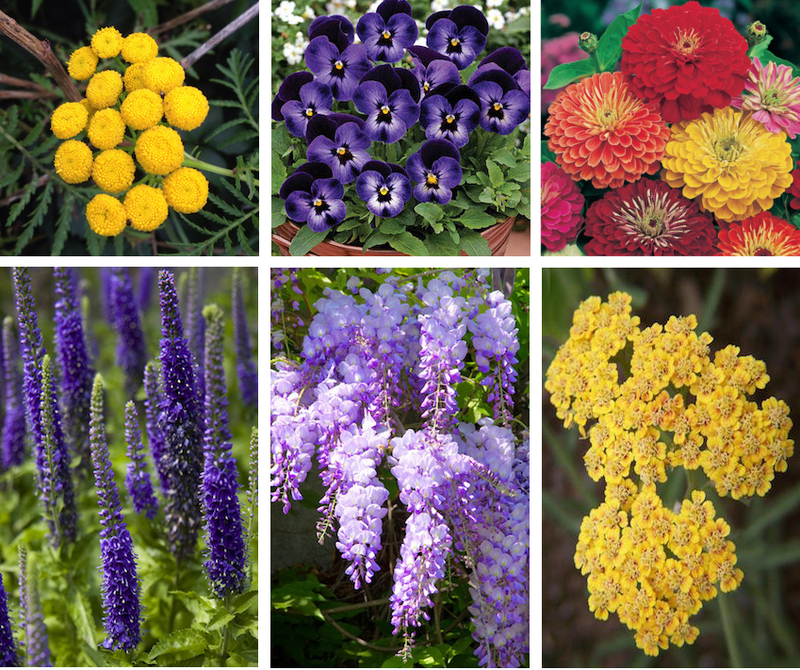 Top: Tansy, Violet (Viola), and Zinnia. Bottom: Veronica, Wisteria, and Yarrow.